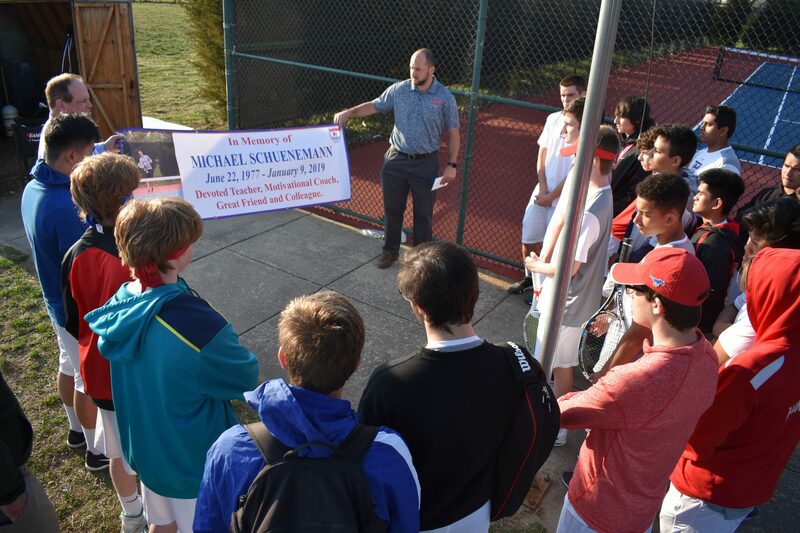 Washington Township’s boys tennis team took their home court for the first time since Michael Schuenemann passed away. The beloved boys and girls coach was known for his unflappable positivity. Along the land that’s home to Washington Township High School’s tennis courts is a small set of bleachers that rests under a permanent canopy. It’s a place for high school players to watch while cooling off from the sun. The last time it was that warm out here, Michael Schuenemann was there, calmly walking toward the fence, hands in his pockets and comforting words coming from his heart. Schuenemann exuded positivity. It was his way with his players that separated him from the pack of teachers the kids interacted with every day. 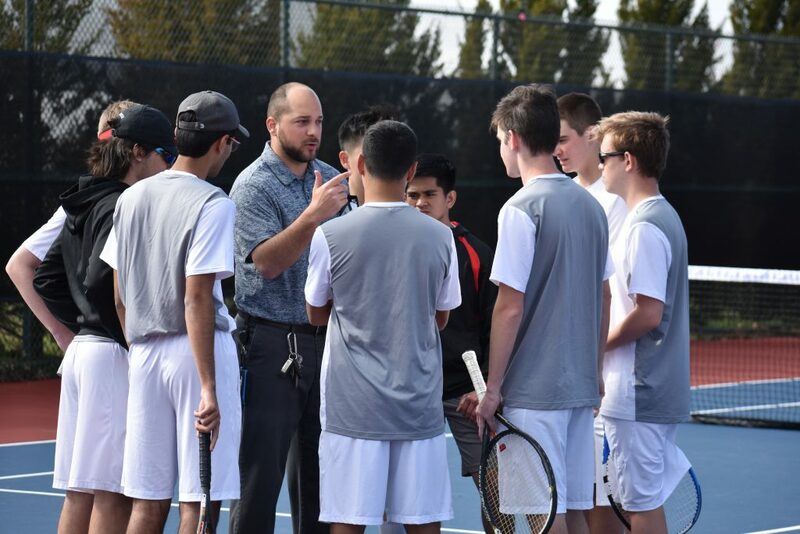 It was tragic, then, when the Minutemen hosted their first match of the 2019 season and Schuenemann was no longer with them. Washington Township’s tennis team poses with the banner that was hung on the fence of their home court following the first home match of the 2019 season. (RYAN LAWRENCE, South Jersey Sports Weekly). 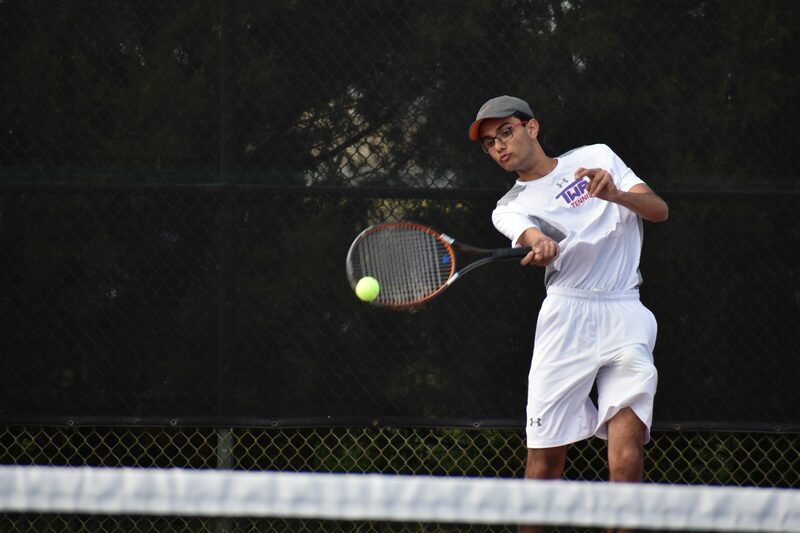 On April 4, Washington Township’s boys tennis team played its first home match of the spring season. On Jan. 9, less than three months earlier, their beloved head coach passed away after a brief bout with cancer. Michael Schuenemann, a Berlin native who began his teaching and coaching career at Washington Township 15 years ago, was only 41 years old. He was married with three young children. 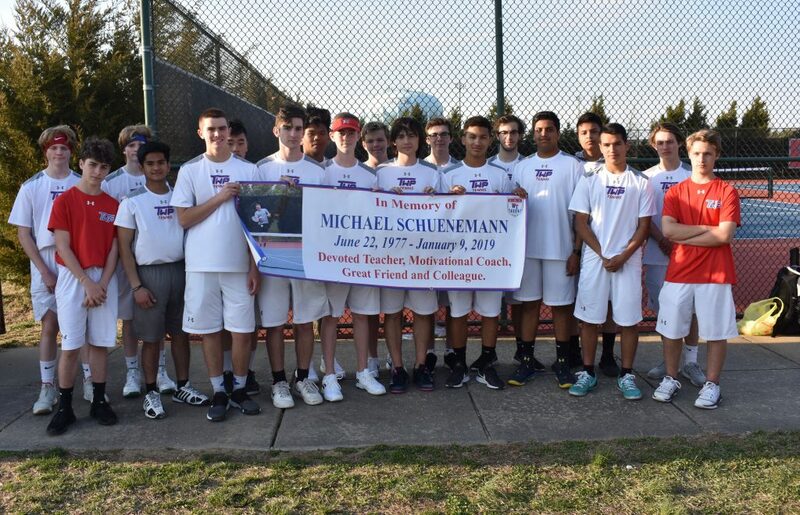 Following Thursday’s match against Lenape, the Indians coach called the Washington Township team together and presented a gift card, to be given to the Schuenemann family, in honor of the late coach and the team he left behind. Shortly afterward, one Washington Township parent approached athletic director Kevin Murphy about her wish to start a fundraiser to get a bench and plaque to put within the tennis court area in Schuenemann’s honor. Before departing the school following the team’s first home match since Schuenemann’s passing, Murphy pulled a poster tube from a storage space and handed it to new coach John Basile, who worked as an assistant under Schuenemann during the girls tennis season in the fall. The two men unfurled a banner and presented it to the Minutemen players before hanging it in its rightful place, overlooking the courts. In Memory of Michael Schuenemann: June 22, 1977 – January 9, 2019. Devoted Teacher, Motivational Coach, Great Friend, and Colleague. “This season is for him. … I know I’m coaching for him,” Basile told his team. Senior first singles player Nick Curcio said he was “absolutely” playing his final season for his former coach. 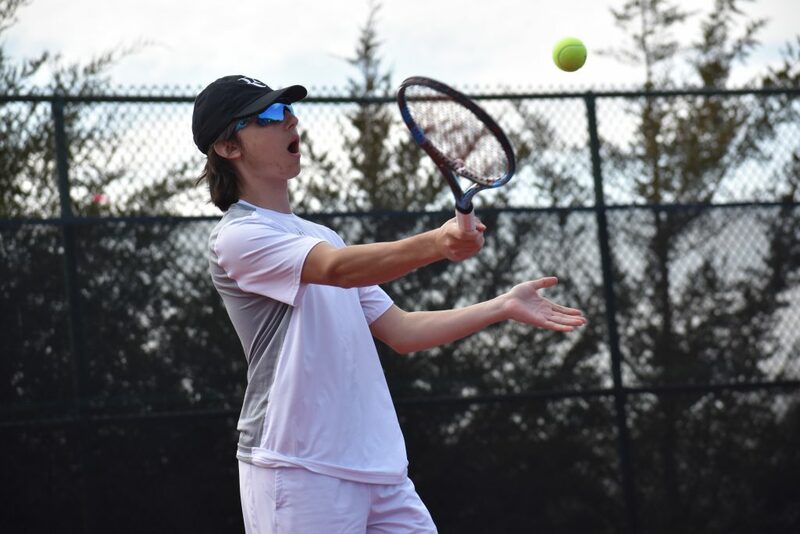 Washington Township’s tennis program, a collection of teenagers not unlike any program at any other school, was forced to grow up quickly this year. The 2018-19 school year began with a highlight: the girls team collected the Gloucester County Tournament championship in early September. But it was only a little more than a month later that Basile said Schuenemann was bothered by symptoms he couldn’t shake. Gabe Donados was at the football team’s homecoming game on Oct. 26 when his mom texted him to let him know the “out of nowhere” news that his coach had cancer. Hornibrook was at a soccer game and saw he had a text message from a senior who had graduated last year. Basile, a 25-year-old, first-year head coach, gathered his Minutemaids into a classroom at the high school. Less than six weeks after Schuenemann helped guide them to a county championship, he was gravely ill and his assistant coach had to tell the team. In the 10 weeks from Halloween to New Years, the news wouldn’t get any easier. Schuenemann passed away during the first week of classes after the holiday break. “I don’t even have words for how any of us felt,” Basile said. Washington Township teachers and the community at large have since come together to help Schuenemann’s family with fundraisers. In mid-January, the high school’s Interact Club hosted its 16th annual “Monzo Madness,” a dance-a-thon that raises money for ALS, and donated half of the $15,000 proceeds to the family, too. But now tennis is back at the high school and the grieving continues. The Minutemen have modest goals for the season. Their only desire is to honor Schuenemann’s memory. Regardless of the game score, remain upbeat. Tomorrow is a new day. 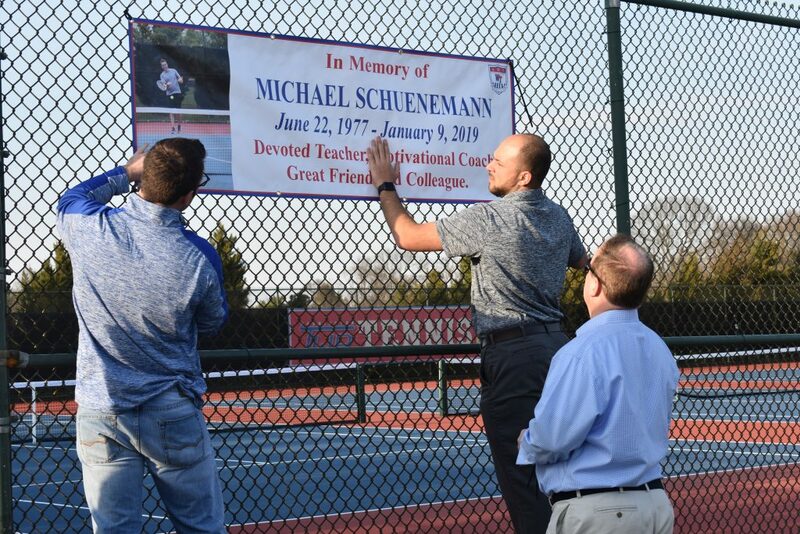 Washington Township tennis coach John Basile secures the banner honoring his predecessor, Mike Schuenemann, who passed away of cancer at the age of 41 in January. (RYAN LAWRENCE, South Jersey Sports Weekly).